X520 discrete op-amp in every channel, socketed for convenience. I bought this to replace a Warm Audio TB12, which is a lovely bit of gear. I figured that losing a few seldom used options (I could never hear a big difference between the nickel and steel transformers) would be minor compared to gaining three additional channels. I couldn’t be happier with my decision. 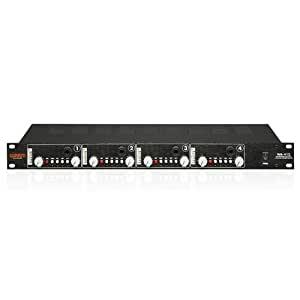 This is a great preamp. It sounds at least as good as the TB12. It’s an amazing value in an incredibly useful format. Also, I’m glad to loose the power wart that came with the TB12. I have 3 of these. Importantly, I also own an API 3124. When I bought the first WA 412, I was thinking it would probably be a fools errand, and I’d kick myself for thinking anything could run with API at this price point. But used on drum overheads and toms, it ran with the API all the way. I flipped to using it for Kick and snare, with a dual element kick mic using 2 channels, and snare head and strainer in the second 2. It equals the 3124. there are subtle differences, but it’s that good. I have an older 3124, so the output control on the WA 412 is a differentiator between the two. To be able to push input to breakup and throttle back the output so I don’t crush my converters is a nice thing. On vocals, guitars, bass, it is just big and present and wonderful. Like an API 312. I’m just going to throw this down- I may sell the API so I can try some of Warm’s 1073-style pre’s, and maybe a TB-12. Because 4 channels of the API was MORE than 12 channels of Warm Audio’s. If you need a good, versatile pre for your studio, this should be on your short list.